The Swine Flu, it's everywhere. You can't open a newspaper, have a discussion with a coworker or listen to the evening news without being inundated with information about it. The coverage of Swine Flu has already reached pandemic proportions and this is causing people to throw away money on a many things, but most of all masks. According to an article in the Times Online some doctors in the U.S. have prescribed painters masks to patients concerned about the swine flu. In addition to that poor advice, medical stores in many states are reporting runs on surgical masks. To start off with the obvious, painters masks aren't designed to protect you from a virus, they are designed to stop you from inhaling paint particles which are bigger than a virus. The only paint masks which would come close to offering any kind of protection from the Swine Flu are N95 rated masks which are the same grade as professional surgical masks. As for surgical masks, yes they afford some protection, but according to Doctor Mark Gendreau's Q&A in the NY Times, run of the mill masks only filter 68% of small particles and professional grade ones block 98%. 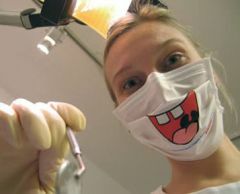 Even then he cautions that you don't need to wear one unless the disease becomes widespread or a pandemic is declared. Dr. Gendreau suggests that rather than wear a mask, "Bring an extra mask along, and kindly offer it to anyone coughing or sneezing who looks sick." This is due to the fact that masks are meant to keep infectious particles out of the air rather than filter them from being breathed in. Even the acting head of the CDC thinks face masks are ineffective at stopping the spread of these types of diseases. Instead you should take the $3 or more that you would waste per mask on some soap and watch this video on how to properly wash your hands. If you want to be extra careful, splurge on some hand sanitizer. But it's not the time to raid your emergency fund for surgical masks. I'm not saying you shouldn't be concerned about the Swine Flu, just that you should use common sense before purchasing anything meant to combat it. You'll fare better if you don't stress out about the Swine Flu and just wash your hands more frequently than normal. Considering the fact that the regular Flu killed 36,000 people in the U.S. last year the Swine Flu has a way to go before it rivals the yearly flu virus and many more before it becomes a pandemic. Chill out, keep your money in your wallet, and let calmer minds prevail.